Image showing periodicity of the chemical elements for electronegativity (Mulliken-Jaffe - s) in a periodic table cityscape style. 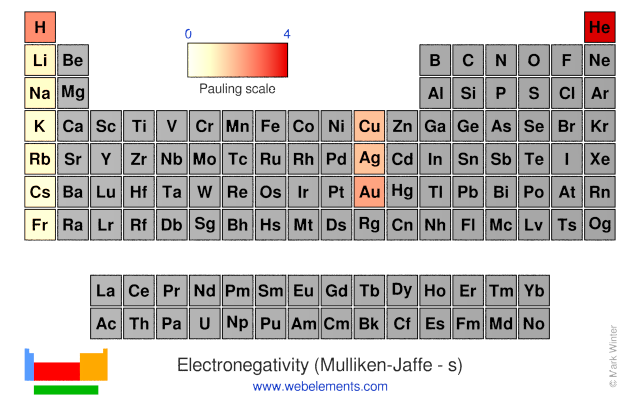 Image showing periodicity of the chemical elements for electronegativity (Mulliken-Jaffe - s) in a periodic table heatscape style. 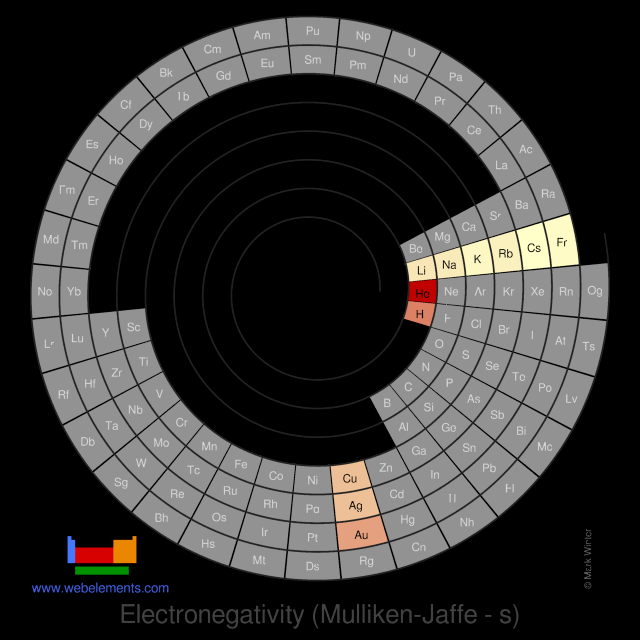 Image showing periodicity of the chemical elements for electronegativity (Mulliken-Jaffe - s) in a spiral periodic table heatscape style. 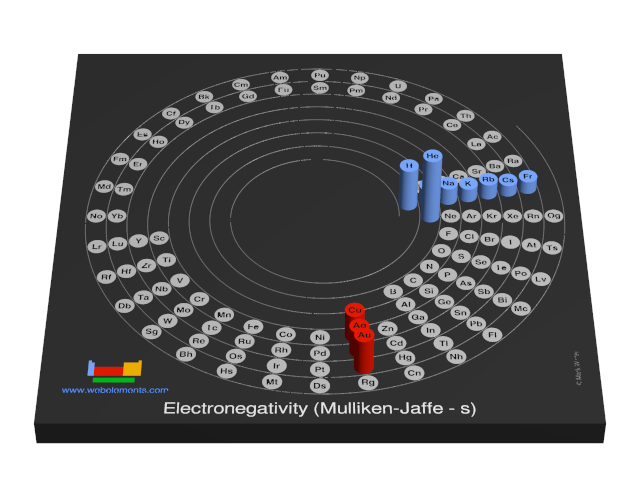 Image showing periodicity of the chemical elements for electronegativity (Mulliken-Jaffe - s) in a 3D spiral periodic table column style. 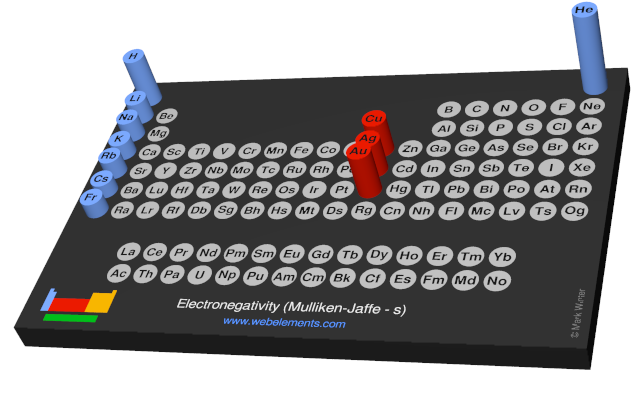 Image showing periodicity of the chemical elements for electronegativity (Mulliken-Jaffe - s) in a 3D periodic table column style. Values presented here are largely from reference 1. Mulliken's proposals are to be found in references 2 and 3. Tables of values are also given in references 4 and 5 as well. You can look at visual representations of the various electronegativity scales using the following links. S.G. Bratsch, J. Chem. Ed., 1988, 65, 34. R.S. Mulliken, J. Chem. Phys., 1934, 2, 782. R.S. Mulliken, J. Chem. Phys., 1935, 3, 573.